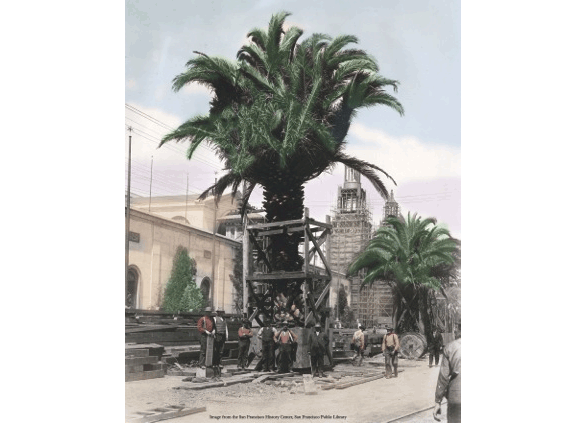 In the spring and summer of 1914, several hundred palms made the trip from Niles to the Panama-Pacific International Exposition construction site in San Francisco. The palm trees were mature specimens, eight to thirty tons each, from the California Nursery Company located in Niles which is now a part of the city of Fremont. The palms were moved using the technology of the day: horse-drawn wagons, trains, rail barges, and cranes. The palm trees, Canary Island date palms and California fan palms, lined the half-mile-long Avenue of Palms in two double rows. They were planted from the Palace of Horticulture, past the Tower of Jewels, and beyond the Festival Hall. The California Nursery Company of Niles in 1915 was a 50 year old nursery. They provided the palms as well as more than 12,000 other plants for the PPIE. The exhibit contains photographs from Niles and from the Exposition construction site, nursery records, and nursery catalogs. The palm exhibit is supplemented with pieces from the PPIE collection of the Pacific Coast Numismatic Society: souvenirs, books, medals, photos, and more. While you are in Fremont, you can also visit the California Nursery Historical Park in the Niles District of Fremont.